Blog 7, Lucky Lucky 7. Probably not for the people reading this blog, but somewhere there is somebody who is lucky. This Blog today is a continuation of yesterdays post. My niece (who flew back to South Carolina at the ungodly hour of 6am this morning…bye AP, hope to see you again soon) and I rode in the Pride Parade here in Albuquerque and I used that opportunity to try out my brand new, unopened and untested helmet video camera. I had planned to take some of my video clips and make them into a single movie, which I would then inflict share with all of you. And by “all of you” I mostly mean the clatter of voices in my head. Just this morning I made a major executive decision, after a brief discussion with said voices in head, and decided to post the individual clips instead. Why? Some could say laziness. In fact 3 of the clatter voices said laziness. But I beg to differ. If I edited all the clips together there would be one fairly long video that would likely bore the pants of many of my “readers”…and yes I like to live in a delusional world where I actually have readers. A) The clips are short and likely/hopefully less boring to watch. B) Readers get to choose which clips to watch and how many to watch. Watch a couple, watch them all; it is all your Choice. And isn’t that what AMERICA is all about? Choice, Freedom and the option to watch endless YouTube videos of sleeping cats falling off TVs or post-anesthesia children cursing like Longshoreman. C) Instead of one long introduction to a single clip, I now get to make several, short pithy comments…and I love to be pithy. D) There is no D.
I decided to break it down like this: Some pre parade clips, Some parade clips, and a single post parade clip. Short clip. 16 freaking seconds of your life. Of course it is also a boring and semi useless clip. But it shows my niece, the Enertia and our place in line (just in front of the Taos Pride truck). ** Plus I am just learning how to use the video camera, so I considered this a practice run. Sadly the whole day was a practice run since I couldn’t check how I was doing until I got home and hooked up the camera to my computer. **We could have ridden with the Dykes on Bikes at the front of the Parade. We did hang with them at first and almost went with them. But they tend to ride fast–well fast for Parades–and I, probably incorrectly, thought it would be better to go slow and be in the middle of the parade. Next year, I will likely be a “Mike with the Dykes on Bikes”…which is a guy who rides with the women up front. It just looks a bit more fun. Ok..12 seconds and purely to show that the TV News was there. I am an attention whore. Again, showing a News van, this time radio. Yes, I am constantly seeking attention and confirmation…I should probably be in Therapy…ok, I should probably be in more Therapy. Ok, I should probably NEVER leave therapy. Shuddup voices! Ok, So finally The Parade. I have way too many clips and will try and limit it to just a few. This first clip is from the very start of the Parade. I let my passenger know that some kids are coming up, so get ready with the Candy. I also notice a small group of Protesters. This actually surprised me. We are a pretty laid back town/city. It shouldn’t have surprise me, but I really didn’t expect anybody to be protesting. Parade clip 3 is on yesterday’s blog. That one is nice for the people up on the roof of Kelly’s Brew Pub. Not going to post the whole clip a second time. But here is a screen grab. At 5:29 it is the longest clip, but a nice one. This shows the second most crowded spot on the parade. ** It feels a bit like the top of a mountain stage in the Tour de France as the crowd really gets in close. Well that and the fact that I had to give a blood sample at the end too…they are really cracking down on performance enhancing drugs here at the Pride Parade. **The most crowded spot is at the end of the parade by the State Fair Grounds…sadly we didn’t quite make it that far…see yesterday’s blog for info on that. Clip 5 is cut. So just imagine how mind-crushingly boring it must have been if these other clips made it and this one got cut. Clip 6 could be cut, but is only 30 seconds…and at 8 seconds in there is a woman pouring water on her dog to cool the dog down…so that is a bit fun. 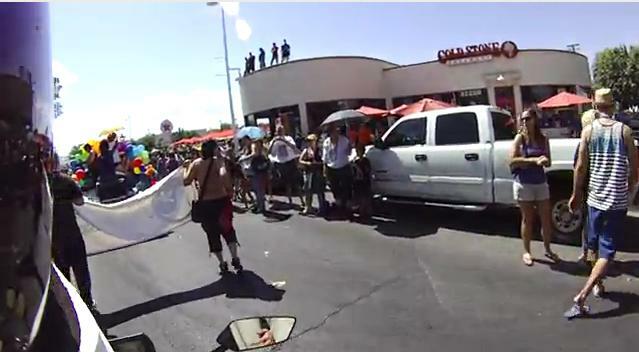 and the last Parade clip…Clip 7.
also short…33 seconds…and largely forgettable. But it does show the Nob Hill location of O’Neill’s Pub…which was featured in my “I Park Where I Want” blog. That and it has me being photographed (4 seconds in) for the millionth time. After the Parade, we went to the surface of the Sun…I mean the Zoo. This clip show where I like to park…also featured in “I Park Where I Want”. You can hear the motor fan running. The clip ends with me looking over to where I am “suppose” to park. Motorcycle Parking? Isn’t everything and everywhere motorcycle parking? What did I learn about filming with a Helmet Cam? 1) Hold head as still as possible. 2) When I do move head, move slowly. 3) Don’t film parades while in them. Boring. 4) Do film more action footage. Get to the mountains and film the bike going fast on curvy roads. That is much more interesting. For Me, the voices in my head and my imaginary readers.